Study: Cloud patterns are shifting because of climate change. 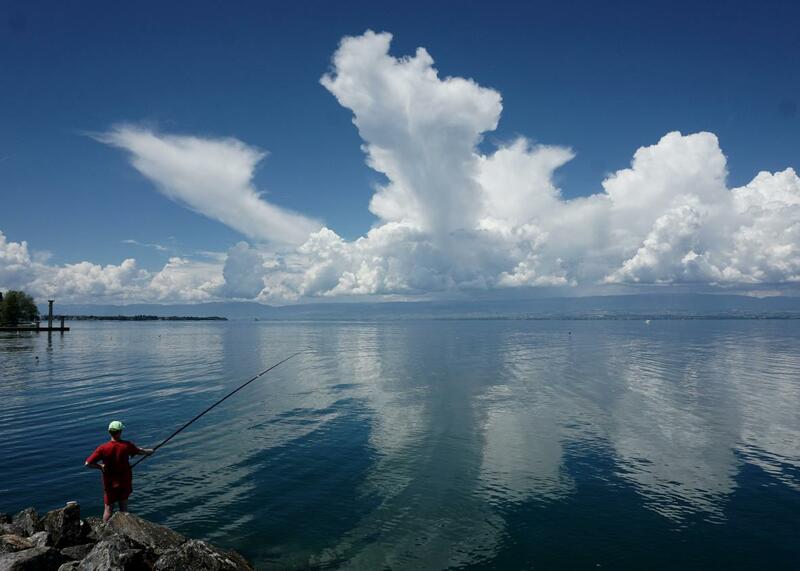 A fisher stands beneath cloud formations on the bank of Lake Geneva in Evian-les-Bains, central-eastern France, on June 7, 2016. The biggest unknown in climate science just got a bit more known, and the results aren’t good. A new study led by researchers from the Scripps Institution of Oceanography at the University of California-San Diego has systematically analyzed more than 25 years of cloud records, starting in 1983—a huge task. On balance, cloud patterns have been shifting toward the poles, the researchers found, and the tallest cloud tops have grown taller. Ramifications from these trends include the drying of places in the subtropics like California, South Africa, and southern Europe and a net warming of the planet. The study, published on Monday in the journal Nature, demonstrates that satellites have been observing the Earth for a long enough time that we can conduct observational studies of climate change. That’s huge. But more importantly, the results themselves provide a critical first data point for a problem that’s been vexing climate scientists for decades. “What this paper brings to the table is the first credible demonstration that the cloud changes we expect from climate models and theory are currently happening,” Joel Norris, an atmospheric scientist and lead author on the new study, said in a press release. It’s never a good idea to put too much emphasis on the results of a single scientific study, but this is a biggie. It’s further evidence that significant climate change has already begun. It also bolsters growing evidence that future climate change could portend greater warming than previously thought. At any given moment, clouds cover about 70 percent of the Earth’s surface. And, as anyone who’s ever seen a cloud knows, they’re bright white. Clouds’ shiny nature tends to greatly increase the planet’s albedo—Earth’s ability reflect the sun’s energy back out into space, and therefore cool down. According to NASA, without clouds, Earth would absorb nearly 20 percent more energy from the sun than it currently does. Since the industrial era began, the leftover specks of sulfur from burning coal (which have increased sevenfold in recent decades) have helped clouds get even brighter by creating tinier cloud droplets. But changing amounts of clouds in key locations—that is, fewer clouds to reflect the sun in certain places—might be enough to offset that trend. That’s what the new study tried to measure. Studying clouds is notoriously tricky, which is a big reason why there’s never been a study like this one. Clouds are ephemeral, and consistent observations from space are difficult to engineer. To overcome this, the study’s authors repurposed cloud data from weather satellites, removed artifacts in the data from changing orbits and other sources, and looked for signs of change in key areas over 27 years. Their results—that cloud patterns are indeed shifting—give more confidence to projections of future change. By looking at clouds over the subtropics, Norris said in an email his study found “widespread reductions in albedo … just as the climate models projected,” signifying an already-occurring poleward expansion of deserts toward the midlatitudes. As a check against the possibility of the observed changes being a result of natural climate variability, the authors simulated 15,000 years of pre-industrial cloud patterns. Not one 27-year period showed as strong a cloud-induced warming signal as the period the authors examined. This study isn’t the final say, however, and some parts of the planet showed an increase in cloud cover over the timespan analyzed. In the process of removing spurious data, the authors sacrificed the ability to analyze changes to overall global albedo. Taken in context with other recent studies, the new results show the net effect of climate change on clouds could in fact be to encourage warming, in contrast to the consensus from just a few years ago. In the most recent full-scale Intergovernmental Panel on Climate Change report, released back in 2013, the consensus was that, on balance, changes in cloud albedo have tended to cool the climate in the more than 200 years since humans began burning fossil fuels at a hefty clip. But the error bars on this assessment were huge, wide enough to include the possibilities that clouds could potentially offset about half of global warming, or actually cause warming themselves. By taking the first comprehensive look at the clouds themselves, the new study demonstrates that changes in clouds are probably causing more warming, not cooling, and the authors expect this warming feedback to continue. That clarity is good news for scientists who have been working for decades on this problem, but the findings could be bad news for the rest of us.